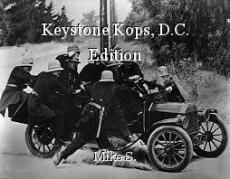 Keystone Kops, D.C. Edition, poem by Mike S.
Hm! The politics of idiocy! Nice one, Mike! Very clever, Mike. Well done. Somebody great once said that there have always been and always will be clowns! Well the who thing is a circus, and you can only blame the clowns who made him a candidate. The big question is, 'will sanity prevail'? I used to be careful about not putting his supporters down, but I just don't understand what the see in this con-man idiot.